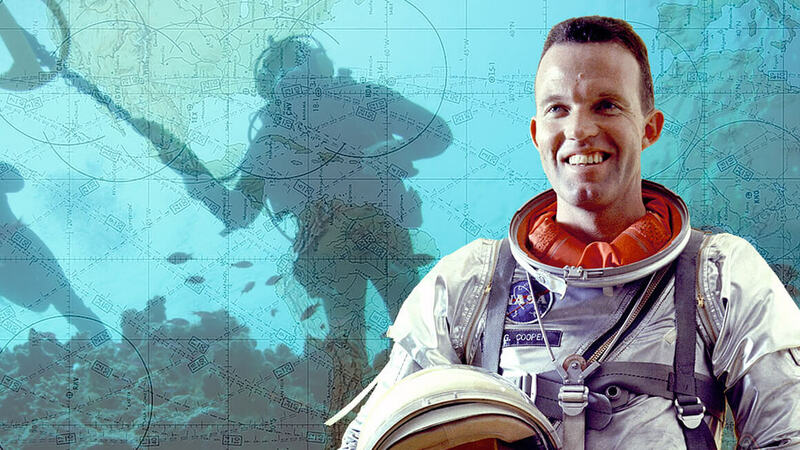 In 1963 Gordon Cooper saw over 100 sunken treasure sites from space and kept their location a secret until he was on his deathbed. Original Mercury 7 astronaut Gordon Cooper was supposed to be looking for nuclear launch sites on his record-breaking Faith 7 flight in 1963. He did his duty over the course of those 22 revolutions around the earth, clicking away on a camera that kept getting loose in zero gravity, barely able to move for 34 hours. But he also kept getting anomalous readings from his equipment, pinging him for objects that were definitely not nuclear sites. The keen-eyed astronaut couldn’t help but put two and two together: metallic hulks beneath the sea, along the same routes used by Spanish traders? It had to be sunken treasure. Cooper splashed down into the Pacific after that record-breaking flight, but he never told anyone — not NASA, not the Department of Defense — about what he’d seen. But he did take notes, scribbled down in the cramped capsule only a bit bigger than himself. Cooper kept his secret for 40 years. Just before his death in 2004, he shared it with professional treasure hunter Darrell Miklos. The two had struck up a friendship years before hunting for treasure-laden wrecks in various seas. Miklos has a long history in the field — he and his sisters would hunt for debris from the space shuttle’s solid rocket boosters. “We were both explorers,” Miklos says. So Miklos hooked up with independent reality TV production studio Ample, which, along with Steven Spielberg’s Amblin Television, has chronicled Miklos’ journey for the aforementioned TV series for Discovery, “Cooper’s Treasure,” premiering April 18. The aim of the show is to connect several different generations of explorers, from colonial times through the present day. The producers don’t have any affiliation with NASA, but the show serves as a reminder of what can be done with space exploration, and the Herculean efforts expended to get there in the first place. Space inside the capsule was so limited that none of the astronauts could be taller than 5’11,” and they couldn’t move their feet. Roberts worked very closely with Cooper throughout the mission. “For me, Gordo was the ‘yes’ on the other end when I asked him to throw a switch,” he said. He also confirmed that Cooper’s eyesight was preternatural — said to rival that of legendary pilot Chuck Yeager — and he could indeed have seen what he said he’d seen. Cooper, once a household name in an America that now seems far removed from today’s, was the youngest of the original seven astronauts, and perhaps the most devil-may-care. “Gordo went to sleep on top of a fully fueled missile and it didn’t bother him at all,” Roberts says. “The other guys, their heart rate might get up a bit at launch, 150 or so. Not Gordo.” His death in 2004 came after a long battle with Parkinson’s Disease, which Miklos says was torture for the fiery, physical astronaut, as it left him unable to control his body with his mind. But though Miklos and the camera crew had no idea if Cooper’s maps would really pan out, they’re now five for five on confirmed shipwrecks at Cooper’s coordinates, with just a little more than a hundred to go. Pope Francis Asked ‘Would You Baptize an Alien?’ Here’s The Answer.